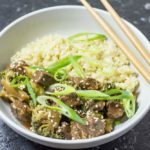 The classic Asian Style Beef and Broccoli recipe but cooked in the slow cooker for a tender beef thats oozing with the flavors of the Orient. And of course, it's "100% Keto"
Place the diced beef, stock, tamari, Surkin gold, sesame oil, sriracha and garlic into your slow cooker and turn to high. Cook on high for 4 hours, until the beef is tender. In a small bowl, whisk the xanthum gum with the water to make a paste. Whisk the paste into the beef, ensuring it is all mixed through. Add the broccoli to the slow cooker and cook on high to 30 minutes, until the broccoli is tender. Serve garnished with scallions and sesame seeds and with a side of cauliflower rice.